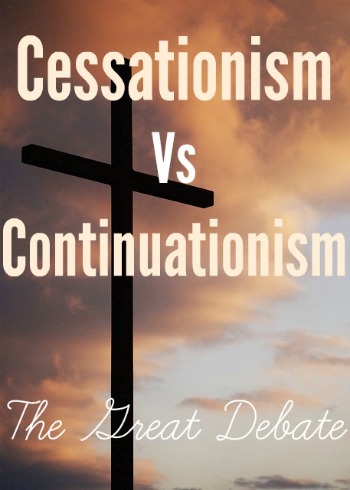 One of the big debates in theological circles today is that of continuationism and cessationism. Before an analysis can begin it is first necessary to describe what these two terms mean. Continuationism is the belief that some gift of the Holy Spirit, that are mentioned in Scripture, ceased with the death of the last apostle. Cessationism is the belief that certain gifts such as healing, prophecy, and tongues ceased with the death of the apostles. This dispute has been widely debated for decades, and shows very little sign of a conclusion. One of the key disputes in this controversy is the interpretation of what these spiritual gifts mean. The gift of prophecy is a perfect example of this. In the Old Testament, God spoke through prophets to warn, guide, and transmit divine revelation (i.e. Scripture). Those who say that the gift of prophecy ceased with the death of the apostles see prophecy as revelation. To an extent that is true, but it is so much more than that. Prophecy can also mean edifying and exhorting the body of believers to be a better witness for Christ. One such theologian that believes in cessationism is Dr. Peter Enns. Dr. Enns is a professor of Biblical theology at Eastern University, and widely respected in theological circles. His work is beneficial to the body of Christ, and has helped me immensely in my theological studies. He writes at length about why he believes cessationism to be the case in his great work The Moody Handbook of Theology. It is this work in which I will primarily be interacting. Though I understand the viewpoint of Dr. Enns in relation to the spiritual gifts I must disagree with his assertion that some gifts ceased with the death of the last Apostle. The gifts of tongues and discerning spirits are gifts I would tend to disagree with Dr. Enns on. Paul is writing to the church at Corinth, and is plainly telling them what to do if a congregation member started to speak in tongues. Though some apostles were still alive, Paul is writing this within the context of church discipline. This is ongoing instruction that he wants the church to follow long after he is gone. Someone must interpret the message, it must not be in addition to Scripture, but must substantiate it. I have been in churches where someone starts to speak in “tongues”, but no one interprets what is said to the congregation. This is counter to Scripture, as Scripture states that one must interpret for the good of all. If one does this it is for the glory of himself, and not for the glory of Christ. We are to constantly see if a new teaching is of God, and we do this by comparing it to Scripture. We must discern these things, and it is an ongoing process. It seems someone is always trying to add some new theology or manmade system. By discerning spirits, we can point out was is right and wrong about something. Scripture is the blueprint, but we must still discern if something is correct or heretical. Dr. Enns also cites this verse in his reasons as to why the gift has ceased. However, Paul speaks of the gift in several of his writings. One such writing is 1 Thessalonians 5:21 which states, “But test everything; hold fast what is good.” It is spoken of in the present tense as something we should be doing on an ongoing basis. I am of the opinion that the spiritual gifts have not ceased, and I am fully aware that some will disagree with me. The gifts do not convey extra-biblical revelation, but compliment them and assist the body of Christ in understanding existing revelation. Anything that claims to be a gift must not say anything contrary to Scripture. If it does it is from the enemy. Are those that hold to cessationism not Christian? No. Are those that hold to continuationism not Christian? Not at all. If we claim Christ, then we are brothers and sisters. It is important to understand opinions that are contrary to our own. We do not have to agree, and it is fine to disagree with me regarding the spiritual gifts. Though this debate is important, the Great commission and reaching souls for Christ is so much greater. Paul Enns, The Moody Handbook of Theology (Chicago, IL: Moody Publishers, 2014), 289. William Hemsworth is a graduate of Liberty Baptist Theological Seminary where he earned a Master of Divinity with an emphasis in Church History. He blogs at theologystillmatters.com, and his official author page is williamhemsworth.com. He lives in Tucson, AZ with his wife and four children.